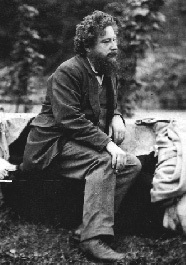 Part of the series of biographies of William Morris. "In his last years Morris modified his long-held anti-Parliamentarian position, agreeing that the time had now come for the formation of a Socialist Party. He did not rejoin the Socialist Democratic Federation (S.D.F.) but ended his breach with Hyndman to the extent of writing several articles for the S.D.F. journal, Justice. In this one he looks back over his life and sums up his development." - A. L. Morten. I am asked by the Editor to give some sort of a history of the above conversion, and I feel that it may be of some use to do so, if my readers will look upon me as a type of a certain group of people, but not so easy to do clearly, briefly and truly. Let me, however, try. But first, I will say what I mean by being a Socialist, since I am told that the word no longer expresses definitely and with certainty what it did ten years ago. Well, what I mean by Socialism is a condition of society in which there should be neither rich nor poor, neither master nor master's man, neither idle nor overworked, neither brain-sick brain workers, nor heart-sick hand workers, in a word, in which all men would be living in equality of condition, and would manage their affairs unwastefully, and with the full consciousness that harm to one would mean harm to all -- the realization at last of the meaning of the word COMMONWEALTH. Now this view of Socialism which I hold to-day, and hope to die holding, is what I began with; I had no transitional period, unless you may call such a brief period of political radicalism during which I saw my ideal clear enough, but had no hope of any realization of it. That came to an end some months before I joined the (then) Democratic Federation, and the meaning of my joining that body was that I had conceived a hope of the realization of my ideal. If you ask me how much of a hope, or what I thought we Socialists then living and working would accomplish towards it, or when there would be effected any change in the face of society, I must say, I do not know. I can only say that I did not measure my hope, nor the joy that it brought me at the time. For the rest, when I took that step I was blankly ignorant of economics; I had never so much as opened Adam Smith, or heard of Ricardo, or of Karl Marx. Oddly enough, I had read some of Mill, to wit, those posthumous papers of his (published, was it in the Westminster Review or the Fortnightly?) in which he attacks Socialism in its Fourierist guise. In those papers he put the arguments, as far as they go, clearly and honestly, and the result, so far as I was concerned, was to convince me that Socialism was a necessary change, and that it was possible to bring it about in our own days. Those papers put the finishing touch to my conversion to Socialism. Well, having joined a Socialist body (for the Federation soon became definitely Socialist), I put some conscience into trying to learn the economical side of Socialism, and even tackled Marx, though I must confess that, whereas I thoroughly enjoyed the historical part of Capital, I suffered agonies of confusion of the brain over reading the pure economics of that great work. Anyhow, I read what I could, and will hope that some information stuck to me from my reading; but more, I must think, from continuous conversation with such friends as Bax and Hyndman and Scheu, and the brisk course of propaganda meetings which were going on at the time, and in which I took my share. Such finish to what of education in practical Socialism as I am capable of I received afterwards from some of my Anarchist friends, from whom I learned, quite against their intention, that Anarchism was impossible, much as I learned from Mill against his intention that Socialism was necessary. But in this telling how I fell into practical Socialism I have begun, as I perceive, in the middle, for in my position of a well-to-do man, not suffering from the disabilities which oppress a working man at every step, I feel that I might never have been drawn into the practical side of the question if an ideal had not forced me to seek towards it. For politics as politics, i.e., not regarded as a necessary if cumbersome and disgustful means to an end, would never have attracted me, nor when I had become conscious of thewrongs of society as it now is, and the oppression of poor people, could I have ever believed in the possibility of a partial setting right of those wrongs. In other words, I could never have been such a fool as to believe in the happy and "respectable" poor. If, therefore, my ideal forced me to look for practical Socialism, what was it that forced me to conceive of an ideal? Now, here comes in what I said of my being (in this paper) a type of a certain group of mind. Before the uprising of modern Socialism almost all intelligent people either were, or professed themselves to be, quite contented with the civilization of this century. Again, almost all of these really were thus contented, and saw nothing to do but to perfect the said civilization by getting rid of a few ridiculous survivals of the barbarous ages. To be short, this was the Whig frame of mind, natural to the modern prosperous middle-class men, who, in fact, as far as mechanical progress is concerned, have nothing to ask for, if only Socialism would leave them alone to enjoy their plentiful style. But besides these contented ones there were others who were not really contented, but had a vague sentiment of repulsion to the triumph of civilization, but were coerced into silence by the measureless power of Whiggery. Lastly, there were a few who were in open rebellion against the said Whiggery -- a few, say two, Carlyle and Ruskin. The latter, before my days of practical Socialism, was my master towards the ideal aforesaid, and, looking backward, I cannot help saying, by the way, how deadly dull the world would have been twenty years ago but for Ruskin! It was through him that I learned to give form to my discontent, which I must say was not by any means vague. Apart from the desire to produce beautiful things, the leading passion of my life has been and is hatred of modern civilization. What shall I say of it now, when the words are put into my mouth, my hope of its destruction -- what shall I say of its supplanting by Socialism? What shall I say concerning its mastery of and its waste of mechanical power, its commonwealth so poor, its enemies of the commonwealth so rich, its stupendous organization -- for the misery of life! Its contempt of simple pleasures which everyone could enjoy but for its folly? Its eyeless vulgarity which has destroyed art, the one certain solace of labour? All this I felt then as now, but I did not know why it was so. The hope of the past times was gone, the struggles of mankind for many ages had produced nothing but this sordid, aimless, ugly confusion; the immediate future seemed to me likely to intensify all the present evils by sweeping away the last survivals of the days before the dull squalor of civilization had settled down on the world. This was a bad look-out indeed, and, if I may mention myself as a personality and not as a mere type, especially so to a man of my disposition, careless of metaphysics and religion, as well as of scientific analysis, but with a deep love of the earth and the life on it, and a passion for the history of the past of mankind. Think of it! Was it all to end in a counting-house on the top of a cinder-heap, with Podsnap's drawing-room in the offing, and a Whig committee dealing out champagne to the rich and margarine to the poor in such convenient proportions as would make all men contented together, though the pleasure of the eyes was gone from the world, and the place of Homer was to be taken by Huxley? Yet, believe me, in my heart, when I really forced myself to look towards the future, that is what I saw in it, and, as far as I could tell, scarce anyone seemed to think it worth while to struggle against such a consummation of civilization. So there I was in for a fine pessimistic end of life, if it had not somehow dawned on me that amidst all this filth of civilization the seeds of a great change, what we others call Social-Revolution, were beginning to germinate. The whole face of things was changed to me by that discovery, and all I had to do then in order to become a Socialist was to hook myself on to the practical movement, which, as before said, I have tried to do as well as I could. To sum up, then the study of history and the love and practice of art forced me into a hatred of the civilization which, if things were to stop as they are, would turn history into inconsequent nonsense, and make art a collection of the curiosities of the past, which would have no serious relation to the life of the present. But the consciousness of revolution stirring amidst our hateful modern society prevented me, luckier than many others of artistic perceptions, from crystallizing into a mere railer against "progress" on the one hand, and on the other from wasting time and energy in any of the numerous schemes by which the quasi-artistic of the middle classes hope to make art grow when it has no longer any root, and thus I became a practical Socialist. A last word or two. Perhaps some of our friends will say, what have we to do with these matters of history and art? We want by means of Social-Democracy to win a decent livelihood, we want in some sort to live, and that at once. Surely any one who professes to think that the question of art and cultivation must go before that of the knife and fork (and there are some who do propose that) does not understand what art means, or how that its roots must have a soil of a thriving and unanxious life. Yet it must be remembered that civilization has reduced the workman to such a skinny and pitiful existence, that he scarcely knows how to frame a desire for any life much better than that which he now endures perforce. It is the province of art to set the true ideal of a full and reasonable life before him, a life to which the perception and creation of beauty, the enjoyment of real pleasure that is, shall be felt to be as necessary to man as his daily bread, and that no man, and no set of men, can be deprived of this except by mere opposition, which should be resisted to the utmost. The myth of Morris as a great part of working class history needs to be challenged. The myth keepers have just hidden my comment on the F*bk 'Working Class History'. Unfortunately there seems to be a cottage industry of myth keepers. He was a wealthy businessman not a great artist or writer. His innate classism had a negative effect on the working class people around him. This is argued in detail in a chapter of 'The Conspiracy of Good Taste', originally published by Working Press, which has just been republished as an ebook. This is a repeated theme in working class history and if we are to move forward, classism and its mechanisms needs to be understood. I have never had much interest in Morris's romantic poems and prose and it can't be denied that he was unable to really break from his 'middle class' background and conditioning even as a socialist, which like some others of that era had an influence on the movement not always very helpful, though bracketing him with Hyndman in the SDF seems a bit unfair. It's certainly true also that subsequent art histories and biographies of past socialists have unsurprisingly tended to emphasise those individual written contributions of artists and socialists coming from 'middle class' backgrounds to the detriment of the many contributions of those from the working class, so this contribution helps provide a counterbalance to those. However the authors heavy 'classism', a particular version of questionable 'identity politics' often criticised elsewhere on this site leads them to an overly dismissive approach of both Morris's socialist commitment in his speeches and essays and for my part the subsequent contribution more widely of the 'Arts and Craft' movement to architecture and urban planning. The myth of Morris as a great part of working class history needs to be challenged. The myth keepers have just hidden my comment on the F*bk 'Working Class History'. sorry just seen this. This is nonsense, we don't hide any comments unless they are racist, sexist, discriminatory, abusive etc. However posts containing swear words may be automatically hidden by the page settings, so if your post wasn't visible that would be why. http://www.stefan-szczelkun.org.uk/taste/Chapter3-Morris.html was a thought-provoking piece. However, I think the point is, class society is bad for society as a whole, just as (in a rejection of identity politics); sexism is worse for one gender, but bad for both genders - and racism is much worse for some, but bad for the human race altogether. Supporting socialism doesn't mean you have to worship William Morris or his wallpaper, and socialists can be entirely selective about which bits to use from any figure purporting to contribute.